Check out what some of our many happy customers have to say about our really cool business cards! Congratulations to Gary Moehring for being our dollar bill business card drawing winner for the month of April 2011. Gary is using his cards to promote… well… Jesus. 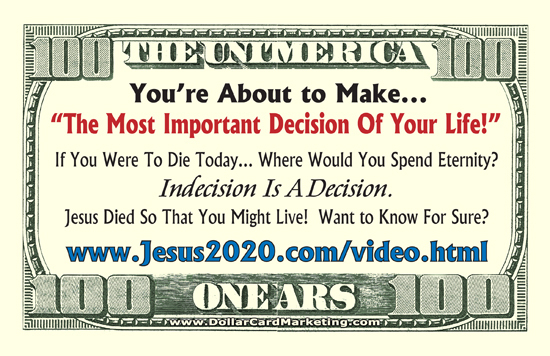 That’s right, our Lord and Savior, Jesus Christ now has his own dollar bill business cards. I don’t think the endorsements can get any better than that! Top notch customer service and the best drop card out there…Period!!! Your Drop Cards Are Amazing.